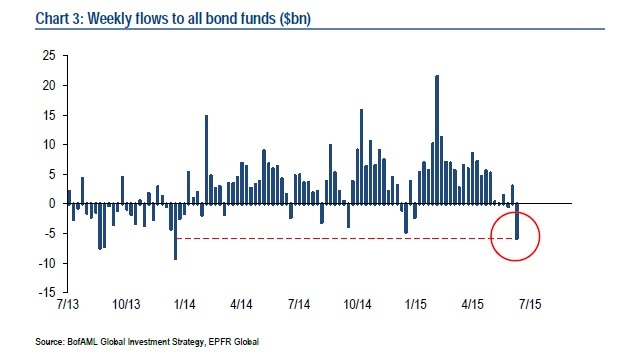 The outflow totalled $5.9 billion in the week that ended on June 10 and was driven by redemptions from high yield bond funds and from emerging markets debt. A “bond massacre” is underway. Source: Bank of America Merrill Lynch. This happened as we’re getting closer to the moment when the Federal Reserve will raise interest rates for the first time in nine years; many analysts expect the first rate hike to take place in September. This could be why global government bonds are on course for their second-largest annual loss in 30 years this year. Looking back at four previous episodes of disorderly redemptions of bonds, analysts at Bank of America Merrill Lynch have discovered that the big outflows from credit funds tend to be preceded by a selloff in high-yield and investment grade bonds of between 3% and 5% over a two-month period. On average, during these periods retail investors’ redemptions from high-yield bond funds were more aggressive, at 5.4% of assets under management, than those from investment grade bond funds, of 3.3% of assets under management. This could suggest that this time, too, holders of investment grade bonds are likely to suffer slightly less than holders of high yield debt. The four periods the analysts looked at were the Fed’s interest rate hikes in 1994 and 1999, the financial crisis of 2007-2008 and the “taper tantrum” of 2013, when the Fed announced the gradual ending of its asset purchases under the quantitative easing programme. They said the overall flows this year “mirror erratic price action of financial markets,” although the Bull & Bear index is well below its “sell signal” of above 8.0, standing at 4.5. The index triggered a contrarian “buy” signal in January. High yield bond funds saw their largest outflows in 25 weeks, worth $2.9 billion, while emerging market debt funds saw the largest outflows in 20 weeks, of $800 million last week. Investment grade funds, which have seen inflows for 77 straight weeks, saw their smallest inflow of that period last week, worth just $200 million. Looking strictly at Europe, and as the yields on German government bonds, the Bunds, spiked — a phenomenon dubbed “bundshock” by the analysts at Bank of America Merrill Lynch – high grade European credit saw its biggest outflow in 102 weeks, worth $1.2 billion. The outflow from European investment grade credit funds was concentrated in the mid-term funds, those with maturities between four and six years. By contrast, short and long-term investment grade credit funds in Europe saw inflows. High yield bond funds in Europe also experienced their highest outflows in four weeks, of $385 million. Looking at other asset classes, equities did not fare too well either, with just Japan seeing big inflows worth around $1.2 billion. As a matter of fact, Japanese stocks have seen inflows in 15 out of the past 16 weeks. US stocks saw outflows worth $300 million, while European equities saw inflows but they were tiny, of around $93 million. Emerging markets saw huge outflows, worth $9.3 billion, with $5.1 billion flowing out of just one exchange traded fund (ETF), the Huatai-Pinebridge CSI 300, which invests in Chinese large-cap stocks. Last week, MSCI failed to include Chinese A-shares, traded on the mainland, in its emerging markets index. This could be another signal to investors not to jump into Chinese A-shares yet, as there are still problems with issues such as access, liquidity and beneficial ownership of the shares.